Yes, here it is, another attempt at keeping a year list. I started keeping year lists – not just blogging about them but really keeping track of what I see each year – as late as 2012, roughly 30 years into my birding career. Back then, in 2012, the motivation was to have something nice to blog about and to show Corey how the cow eats the cabbage since he was seeing too many good species too easily. Therefore, the 2012 list itself was never the focus of my year listing, it was competition and blogging. I realized around 10 months into my first year-list-year that the competitive part is nothing I enjoy. Of course I still beat Corey – three years in a row, mwahahaaaar – but this was the first time ever I experienced pressure in my birding and I didn’t like this one tiny bit. So very soon, the “competition” element was scrapped from my list of reasons to keep a year list. What was left? The blogging element. Therefore, I started to turn my year list into something people would find pleasurable to read. Endless lists of what someone you likely don’t even know and will never meet in your life saw is not something people enjoy. Therefore, I greatly expanded the structure of my year list in 2013 to include maps, statistics and a diary. This was fun. And a lot of work. I was able to maintain the new structure in the 2014 list, and this was a mighty fine birding year in all aspects. However, I started to fail in the following year, and my blog post on 2015 is still – to this day – incomplete. And 2016? Well, I started the post, but I stopped at the end of January and it has joined the ranks of this blog’s eternal drafts. This year however, I really, really want to keep a list again, on this blog. Of course I have to make a few changes in order to give me a realistic chance to maintain the list throughout the year. I failed twice in a row and am too old to be idealistic. Now, I really like the 2013 layout and am planning on keeping it, but I’ll make the diary shorter this year and will keep the list in chronologic order instead of systematic. I am not entirely sure if I am going to include a graph of my species total since I will not define a numerical goal. In 2017, I want to enjoy birds as much as possible. 01 Jan: a busy day, leaving the island of Sylt in the early morning for the long drive back to Heidelberg. 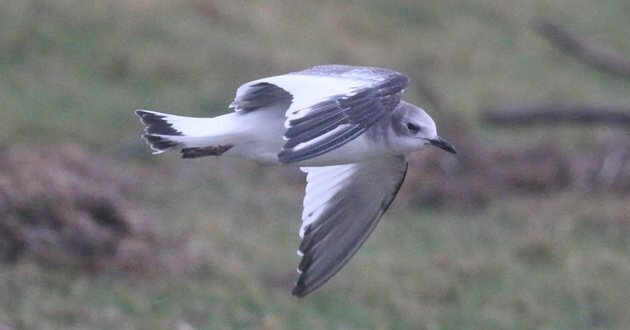 In horrendous weather, I manage to successfully chase a long-staying Sabine’s Gull at Hauke-Haine-Koog, a desperately-awaited lifer. 16 Jan: a boring train ride to attend a meeting in Bonn. Nevertheless, I manage to see three Waxwings flying by the conference centre, which saves the day and makes me happy. 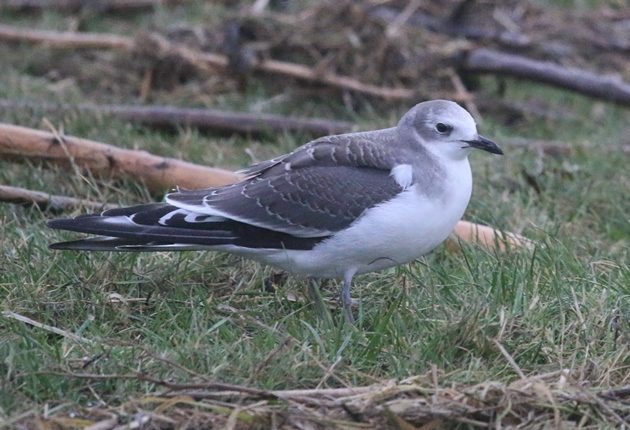 Bird of the month: Sabine’s Gull – an easy choice made even more easy by the fact that it was found during my only birding trip in January. 04 Jan: A nice few hours at a former quarry about an hour away nets me a few nice first-of-years, like Black Woodpecker and Common Raven. 16 Feb: I have to attend a Seminar near Karlsruhe all week and am trapped inside a darkened room during the first week of sunny weather we’ve seen in Ages. However, one fine lunch break I slip out for half an hour for a small walk, with Skylarks flying over. 19 Feb: A business trip to France offers the chance of a quick visit to a nearby large lake, where waterfowl abounds, amongs them a group of 4 Smew – 3 females and a fine male. Further on into France, an endless stream of Cranes heads north-east into Germany. Spring has sprung. 20 Feb: You know you have come to a cool site (near Paris) when Cirl Buntings are part of your front-lawn avifauna. 21 Feb: The drive back to Germany is less exciting but I do see my first Red Kites for the year. Another early spring indicator. 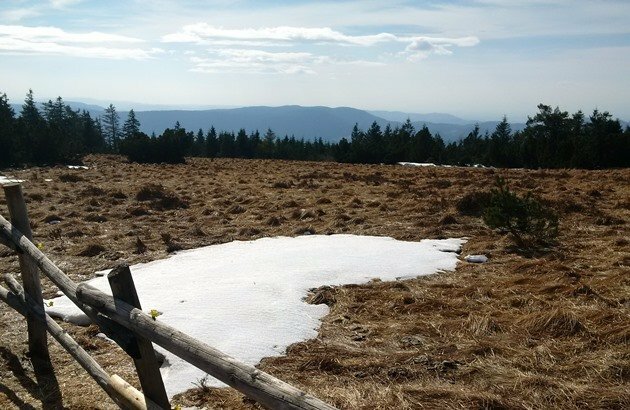 26 – 28 Feb: A very short but marvelous family trip to the heights of the northern Black Forest is a bit too early in the year for some of the specials but nevertheless allows me to encounter a few exciting mountain species, like Spotted Nutcracker and Three-toed Woodpecker. I managed to not take a single bird picture in February, so this landscape shot of the Schliffkopf summit will have to fill that space, a place where I saw Red Crossbills and Meadow Pipits for the first time this year. 12 Mar: Boy, the birding year is slow as I can’t find the time to actually get out and see stuff. A nice short walk through the vineyards outside Rohrbach/Heidelberg produces some first-of-years, like Chiffchaff and Blackcap. 20-24 Mar: my first big road trip of the year, from the lower Rhine towards Münster and Berlin, with some grand observations and my almost-yearly visit of the Great Bustards. 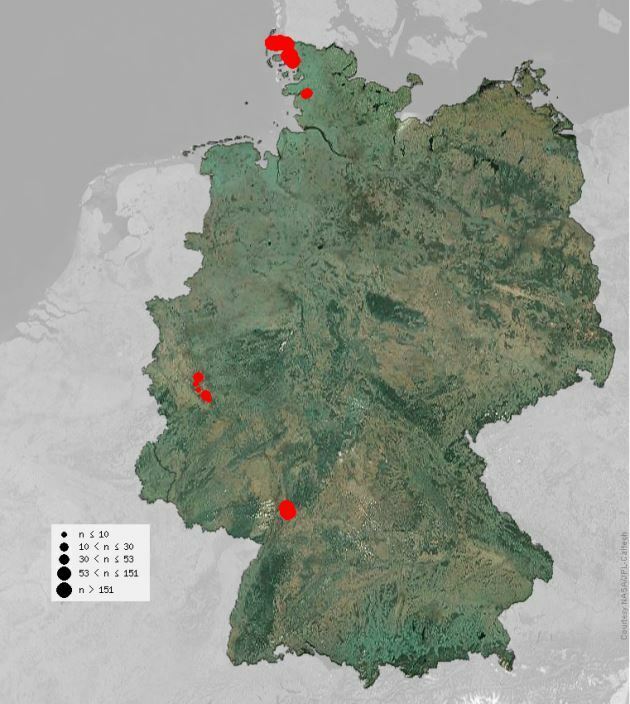 The effect of a low-flying Red Kite on Greater White-fronted Geese, lower Rhine in Germany. The lower Rhine is one of Germany’s finest destinations for enjoying wild geese but I was there a tad too late, only managing more than 1,000 rather than a couple 10,000s. The species list is in chronologic order, mostly because it is easier this way for me to update it and also because this reflects the spirit of a year list better than taxonomic order. Lifers are in red. I too decided to do this year list thing in 2012, but stuck to the principle that I would not change the way I bird….have fun, see what I see, etc.! 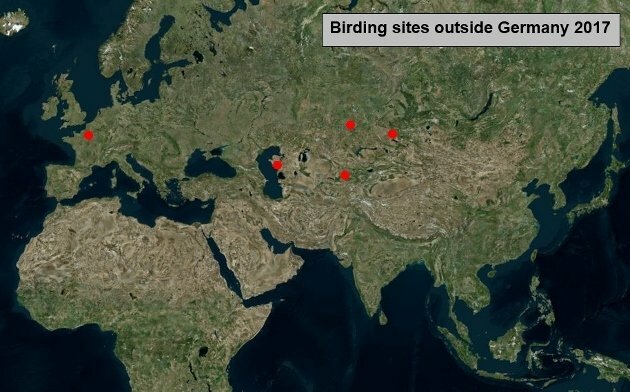 It is interesting how a common bird disappears on January 1st, though, when you start a year list! Yes, birding is so much more fun when you just take in what you find. Sabine’s Gulls are an amazing species with their world-wide migration. I was so happy to finally see one. Very happy to read you also saw one, in Australia!! I just noticed that I had forgotten a few species and now stand at 86. no real birding yet this year except Jan 1st, so it’s a very easy start. Red-breasted Goose – sigh! I used to see them almost each year during my time at the German Baltic coast, but haven’t seen one in likely a decade!! They are amongst the world’s best, so congratulations!! Yes, listing should be all about enjoying the birds. We won’t say anything about the Black Woodpecker. Because that would be mean. And competitive. I would like to see one. And a Red-breasted Goose. This will be the first year I have kept an “Official” bird list…..my year is off to a great start, with all the migratory birds here in Mexico, a trip to mainland Mexico at Guadalajara, and then last weekend to the Pacific Northwest of the US. That puts me a ripping good 152 species…..But, no Red-breasted Geese here either! I want your White-tailed Eagle. Would there not be a sadistic frisson to adding the woodpecker to a list that Corey is a participant in?